With our tour of Do You Want What I Have Got? A Craigslist Cantata all closed up for now, we’ve got to see we’re gonn miss these guys! Luckily, we’ve saved Selina Martin for last. With her quirky, distinct style she has brought so much of herself to A Craigslist Cantata that we couldn’t possibly imagine the piece without her. In our final Craigslist triple threat, Selina shares her deadpan humour that we just can’t get enough of. Do You Want What I Have Got? A Craigslist Cantata – Veda Hille writes incredibly catchy tunes. I still find myself singing them aloud months after the last performance. 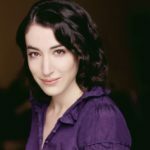 Sara Farb, who started our performing with Acting Up Stage in 2008’s Edges, has become a perennial favorite of ours. She has performed in practically every UnCovered concert, in which Reza Jacobs and Canadian musical theatre stars reimagine the songbook of a pop legend. Today, she takes some time to reflect on this awesome shot of herself from Tapestries. This is easily the most intense photo that’s been taken of me singing. 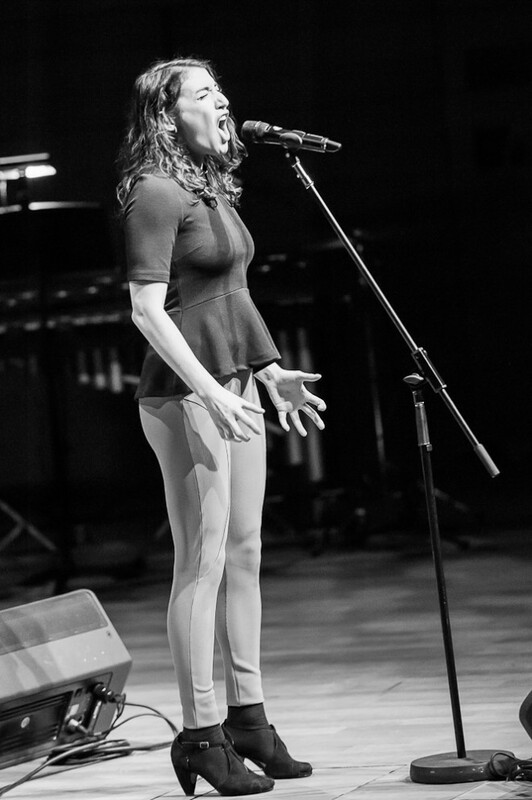 I am always so curious to know exactly what word and note I was singing at the time of a mid-performance photo, although I think I can guess with this one. It was taken during the Tapestries concert, which paid tribute to the music of Carole King and James Taylor. I was blessed with Carole King’s song “Beautiful,” which Reza Jacobs (the concerts’ exceptional musical director and arranger) and I decided should sort of track a mental breakdown, culminating in a really frenetic end to the song. This is an image of that last moment. You can tell because I’m girding my loins to hit my note. Doing the tribute concerts is always one of the highlights of my year. I’ve been so lucky to have been a part of every one since Acting Up Stage started producing them. It has given me the chance to expand my musical repertoire and to collaborate with some of the most gifted performers I’ve ever met. And I am in constant awe of what Reza is capable of. He really is the heart and soul of these shows. I’m so happy that these incredible nights of song have graduated from being fundraisers for Acting Up Stage to staples in the company’s season. Congratulations to Mitchell and all the AUS people on ten amazing years of innovative and engaging theatre. Well ladies and gentleman, today marks the last Tony Tuesday blog from me. 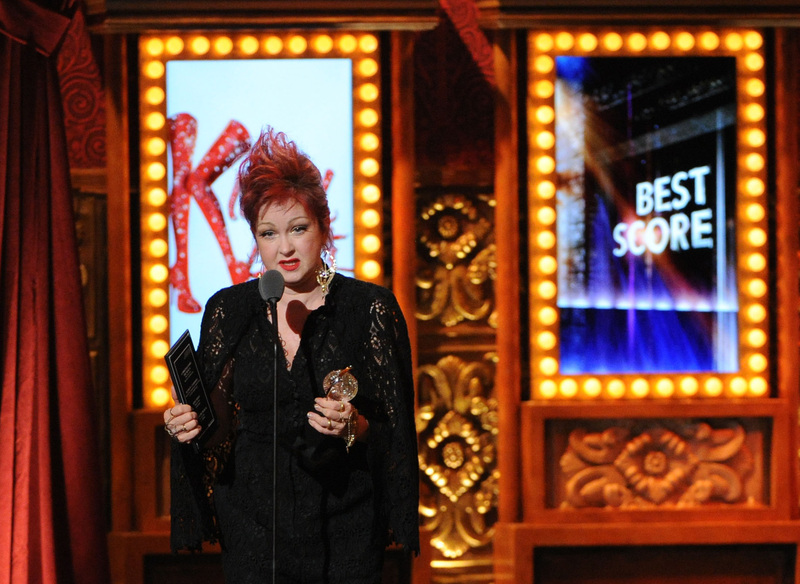 For this last entry, I wanted to veer away from Tony performances and instead look to the most iconic, strange, and beautiful acceptance speeches in Tony history. As the tour of Do You Want What I Have Got? 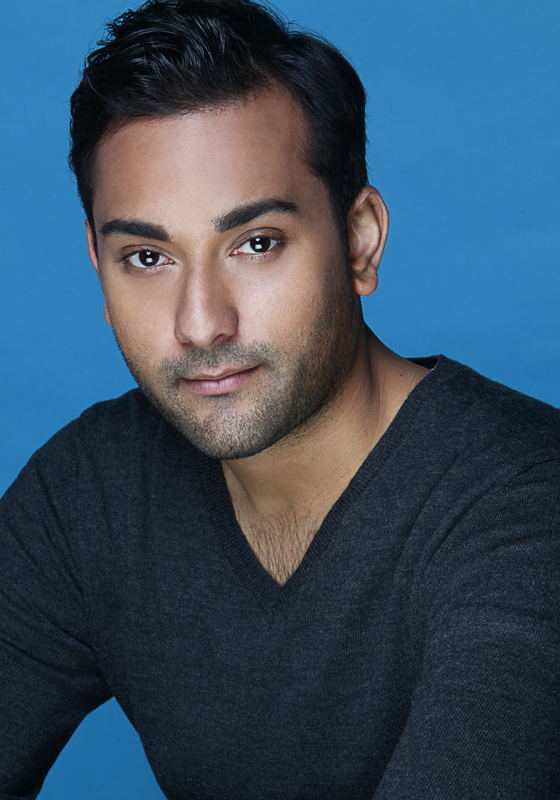 A Craigslist Cantata wraps up, we present the third cast member, Qasim Khan’s, Triple Threat. Qasim’s unique style has brought a distinct vibrancy to the piece, and we’re sad to see the run come to an end. As he gets ready to put his clarinet to bed on Sunday, Qasim indulges us (and himself?) 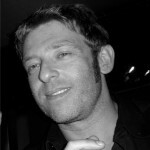 with his love of musical theatre, ABBA and foreign recordings of Mamma Mia. The Phantom of the Opera. I love when composers let contemporary sound seep in to works that sound ‘classic’ like Phantom. I love the vibe that’s created when you mix things like electric guitars and rock drums, or some synthetic textures, with acoustic instruments. There are musical moments in Phantom that will always get me. The Overture, obviously, but there’s a little piece that leads in to “Wishing You Were Somehow Here Again” called “Journey to the Cemetery” that’s stunning. Right now I love scores like Once, and Anne & Gilbert, that are stripped-down and minimal. The orchestrations are so economic, and serve the simplicity of the stories. This weekend, we bid a bond farewell to Edmonton as A Craigslist Cantata wraps up its run there. 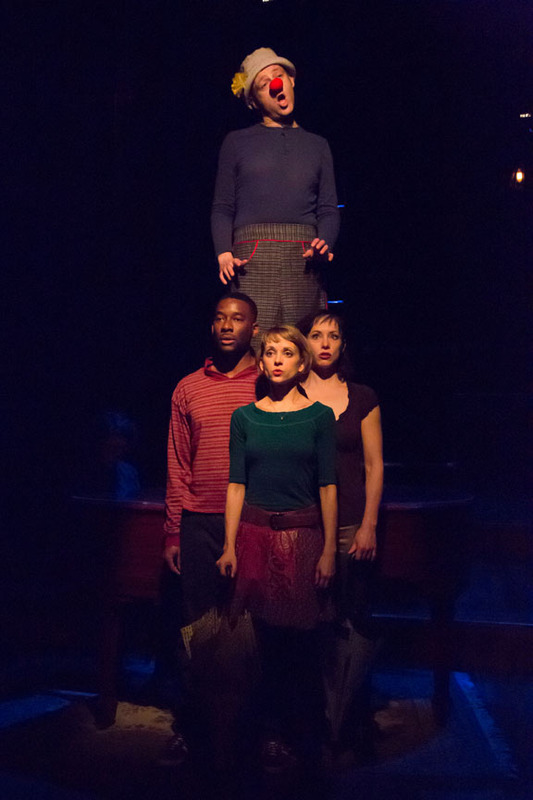 For today’s throwback, we asked Bree Greig (who is wrapping up the Edmonton run) and Dmitry Chepovetsky (who is part of the National Arts Centre’s 2013-14 company) to take a moment to reflect on this shot from last year’s incredible production at Factory Theatre. Bree: This number appeared right before the last piece of the show. When we did the show in Vancouver, I was out in the audience for the first half of this song and got to watch Dmitry’s clown every night which was one of my favorite parts. With the staging of the TO production, I was bummed that I didn’t get to see his performance like I had in Vancouver. His clown was so awkward, silly, yet heart filled and endearing and I really liked that combination of weird, yet somehow sad. To me, that is kind of an overarching theme for the show. We all know about the oddities and weird-ness that’s out there on Craigslist, but these people are honestly putting themselves out there no matter how weird and they crave community and connection just as we all do which can make even the oddest Craigslist ad endearing and heartfelt. Dmitry: So this was probably one of my favourite numbers of the show. The image was a conclusion to the narrative storyline of an earlier song called ‘clown on stilts’. To achieve this, in the blackout between, a nose, a hat, and specifically folded pants, which were stacked behind me on the piano, needed to be added before the lights came up in 16 counts. The challenge, when standing on the piano, was making sure the shoes that were attached to the bottom of the legs faced forward when they hit the floor, to complete the image of the stilts and also of course, hit the narrow corridor of light. It was a fun, albeit stressful game to play. The beautiful arrangement and simplicity of the layered melodies in the round, the call back of phrases of previous songs, the specificity of lighting, and the pathos and longing, made the number haunting, funny and sad. The family coming together before the last number. BTW, this is why the factory studio stage needed to be lowered downstage. 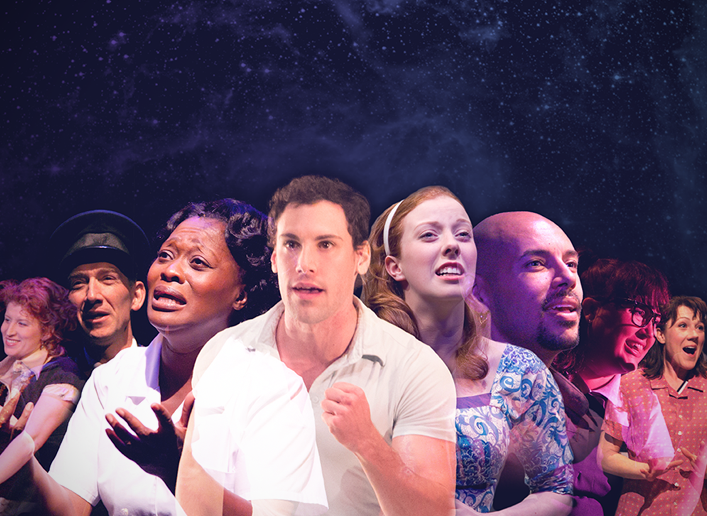 You are currently browsing the The Musical Stage Company blog archives for February, 2014.